In the name of Procrastination, I’ve been wanting to blog all week. It’s Palindrome Week, after all. 4.10.14 – 4.19.14. I love stuff like that. So here, we go. Things that make me happy, with a PALINDROME twist! And there are random photos from the past 4-6 weeks in a slide show at the end of the post, if you have patience and can get there! I am working on my clinical social work license, so I am taking a class to get more clinical content hours. It meets the first Friday of the month for 9 hours. I have three papers due by the first Friday of May and then it will be done. It is interesting and learning is always fun – but papers? Not so much. Oh well. Soon it will be behind me. Driving to class was harrowing in April. Gross. I’m ready for the winter driving to be behind me, as well. I worked a lot of overnights in March – 8 to be exact. I worked 5 in one week as an experiment. I think it worked for me – it’s nice to stay in the “up late, sleep all day” routine, so that transitioning back doesn’t have to happen as often. We’re short-staffed right now (after LeeAnn left), so the schedule is crazy. And it’s crazy spring time, so I think I will have to practice a lot of self-care on work days and on days off. Ah. *IN WORDS, DROWN I. I’ve been reading some books. I finished listening to The Goldfinch. It was looooong but a good read. Theo Decker (“Potter”) has his life changed forever while at a museum with his mother at around age 11. I finished Divergent just before seeing the movie, and now am almost done with Insurgent. I hope for answers in the 3rd book. I’m not as pulled in as a certain 12 year old I know. She loves the relationship. She said she’d loan me Allegiant but I needed to know that it would “hurt me.” She cried for quite a while when she finished. 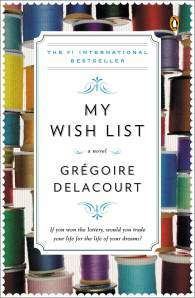 I did a review of My Wish List: A Novel, which you can read more about here. I can’t wait to see the movie! I’m reading The Boy Who Was Raised as a Dog for my class, and it is interesting and terrifying. I put down Mo’ Meta Blues until I get through that Divergent series! Can’t stop now! My Kindle and nook apps are filled with books that need to be read… I can’t wait for this class to be over! 12 Years a Slave – Certainly not a ‘feel good’ movie, but very powerful. Divergent – I liked the movie a lot, much more than the book. I thought the changes they made were meaningful and the movie just flew by! The Grand Budapest Hotel – This movie was made for me! Whimsical, magical, and unpredictable! I had a smile on my face throughout the entire thing! The Great Beauty – The opening film of the Rochester International Film Festival and the 2014 Best Foreign Film Oscar winner. It was long, riotous, and a little obtuse. I read an article about it the next day which helped me understand it a bit more, but it was a joy to watch, so that’s fun, even if it was hard to understand. Iron Man, Iron Man 2, Iron Man 3 – For some reason I had the urge to watch these movies, so I got them on DVD from Netflix. They were pretty fun, but I’m kinda done with the superhero movies for a while. I’m an *AVID DIVA – *“RUM… RUM…” I MURMUR. – I’ve had some nights out! Chris and I had a Thursday night off so I was looking for something to do. And lo, and behold, there is Trivia Mafia in town! So we invited Kristine and Mike to join us for some beverages and trivia at Big Brad’s! I love trivia and we held our own! We had a grown-up slumber party at Beth’s – margaritas, pizza, and girl talk! So much fun – and so needed! Of course, there was Peter and the Starcatcher – you can read about that fun night here! We had a work happy hour to say goodbye to LeeAnn! She relocated to the Cities and we miss her much! St. Patrick’s Day was a hoot. Chris and I went to Dooley’s and parked in a booth and enjoyed bagpipes, funny costumes, good food and good company! We had to start early since I had to work very early the next day. Another recent weekend off (they feel so few and far between! ), we saw The Grand Budapest Hotel with Jenny and Tammy and then met Kristine at the Loop for dinner! It turned into a Girl’s Night Out + Chris! He could hang with us and it was a lot of fun. Good conversation with good friends. Cosmo Girls was a blast. We met at the Rochester Art Center and enjoyed a guided tour (two guides/curators!) and the art project they had set up for us afterwards. We laughed a lot, got a lot of good pictures, and learned a lot! We had so much fun together. One of those precious Saturdays off I got to watch Rees play basketball and eat at his choice – the food court at the mall! I hosted another Book Party – the theme was Books Into Movies and we drank Bridget Jones’ Daiquiries (strawberries and champagne!) and we talked about books and laughed a lot! This is going to happen again (and again and again…). Girl time with a pedi is always the best. Ah. On April Fool’s Day, I made a Screwy Lewie – so delicious! And such fond memories of childhood slumber parties – mine and Marissa’s. Spring has finally shown its pretty head (every now and then) and we’ve enjoyed long walks outside and our first dinner and drink on a patio. Looking forward to more time outside with the nicer weather! The “blood moon” from the lunar eclipse was this week and we were able to see it. Small adventures in the middle of the night are pretty fun! There’s a new coffee shop in Rushford and before choir (yay choir!) Mom and I went there to get a sandwich and coffee to go! It was delicious and I can’t wait to go again for a leisurely coffee with friends! Lisel Mueller, “Palindrome” from Alive Together: New and Selected Poems. Copyright © 1996 by Lisel Mueller. Reprinted by permission of Louisiana State University Press.